Becton Regional High School's staff and students show their support for heart disease awareness on National Wear Red Day. Becton Regional High School’s faculty and students joined together and wore the color red on Feb. 1 in support of Heart Disease Awareness Month. Furthermore, the Becton community is taking a stand for their country’s health one dollar at a time. For example, the high school’s Key Club and its adviser Mrs. Bonanno are organizing a bake sale during after school hours on February 14. Teachers will also be permitted to wear jeans and students can wear hats to school on the holiday in exchange for a donation, which will go toward the American Heart Association. The junior class will also continue to collect donations during the common lunch period until the end of the month. 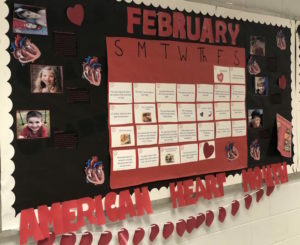 Juniors Samantha Zawadzki, Briella Novello, and Alyssa Nozka created a bulletin board in Becton’s main hallway. As further stated by the Center for Disease Control and Prevention, there are many symptoms that people will exhibit when they have heart disease. For instance, one will feel consistent chest pain and discomfort. Both men and women with the disease will also feel light-headed and experience nausea and shortness of breath. People may also have irritation in their necks, back, arms, shoulders, and jaw. And of course, another major sign of heart disease is having a heart attack. Heart disease is caused by various circumstances such as high cholesterol, high blood pressure, and smoking. Other factors that put people at risk are diabetes, poor diet, no physical activity, overuse of drugs and alcohol, and being overweight or obese. The CDC recommends that in order to prevent this deadly disease, men and women are advised to follow a healthy diet, manage stress, not smoke, and exercise daily.